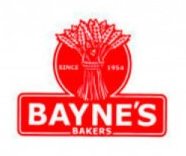 Bayne’s is a family bakers with a proud tradition of serving great value, freshly baked, quality products. Savour our iconic morning roll and our hand-crafted breads, or enjoy a savoury just out the oven. If you have a sweet tooth, why not try a cream cake or something from our teabread range? Or liven up your lunchtime with a filled roll, which we prepare daily in store. We also have an excellent range of hot and cold drinks, including freshly ground coffee. And don’t forget our made-to-order celebration cakes, which are the perfect way to mark a special occasion.